I’ve set myself a big challenge this year. I am going to try to paint one new oil painting every day. It’s a way of building my skills in oils, which is part of my plan for this year. I have decided to take the year off exhibitions in 2015, in order to improve my painting. I haven’t had enough of a chance to do that lately, with running two big solo exhibitions each year since 2008. Because my art was selling so well (which I am really happy about! 🙂 ) I was always under a lot of pressure to paint dozens of new artworks for each exhibition that loomed. 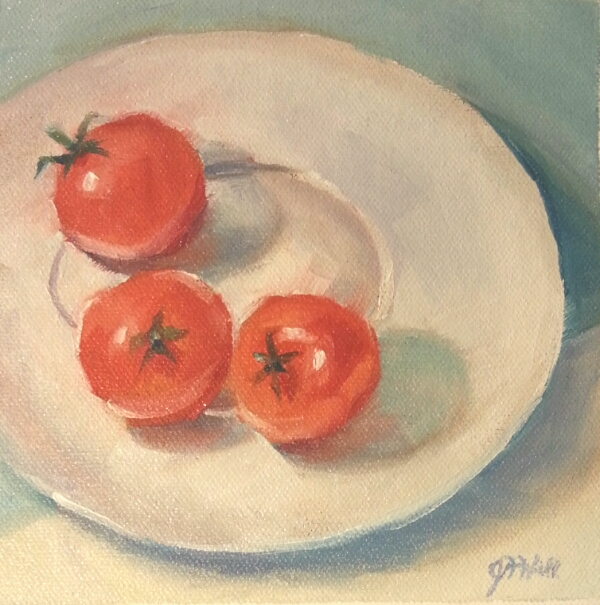 So I had fun setting up my first still life painting for the year with these little cherry tomatoes on a saucer in the studio. This painting took me just over an hour. I was captivated by the glow of the light on the fruit. All of these paintings are for sale. Contact me if you’d like to snag one.